William Matthew photo from the UCMP archives. William Diller Matthew was born in St. John, New Brunswick, February 19, 1871. He attended New Brunswick College and later went on to Columbia University, where he studied vertebrate paleontology under Henry Fairfield Osborn and achieved his Ph.D. in 1895. 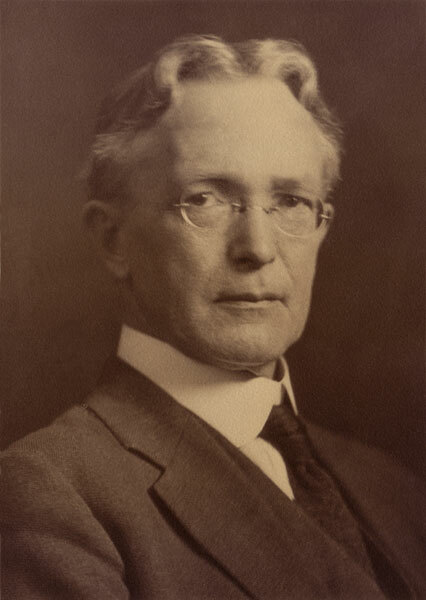 His career at the American Museum of Natural History in New York City began as Assistant Paleontologist but he eventually became Curator in Chief of the Earth Sciences, a position which he held from 1922-27. While at AMNH, Matthew published some 240 scientific papers, his most important being Climate and Evolution, 1915. In 1927 Matthew was elected a member of the Royal Society of London and also accepted appointment as Professor and chairman of the again separate Department of Paleontology, and Director of the Museum of Paleontology at the University of California. Matthew was highly regarded professionally for his many publications on fossil mammals, for refining techniques of recording the stratigraphic occurrence of fossils, and for his biogeographic studies. Although he had never taught before coming to Berkeley, his introductory paleontology course attracted the largest enrollment that this subject has ever attained at Berkeley before or since. An advanced course on fossil mammals drew numerous graduate students, among them Hildegarde Howard and Ruben A. Stirton, and others who went on to achieve prominence in paleontology. Matthew was responsible for expanding the field work of California vertebrate paleontologists to include the fossiliferous deposits of the Great Plains and Rocky Mountains. He published on the dogs, horses, and rhinoceroses collected during two field seasons in the Texas Panhandle. He spent summers at the American Museum, completing several papers on the Siwalik faunas, multituberculates from Mongolia, and phylogenetic studies of diverse mammalian orders. He was engaged in completing his monograph on the Paleocene faunas of the San Juan Basin in the summer of 1930 when he was struck with a kidney illness that proved to be fatal — Matthew died on September 24, 1930. The Paleontology Department was again left without a leader. Although Matthew’s tenure at Berkeley was brief, he succeeded in turning around the faltering research program in mammalian paleontology, attracting new graduate students, building up undergraduate enrollment, and enriching the museum collections with material from east of the Rocky Mountains. He argued strongly for greater financial support for the teaching department based upon enrollment. Miss Alexander was enthusiastic about his leadership of the University paleontologists, and shortly before his death, made her first tentative proposal to establish a permanent endowment for the Museum of Paleontology. From the May 1996 UCMP News newsletter; supplemental information from 1931, University of California: In Memoriam issued by the UC Academic Senate.